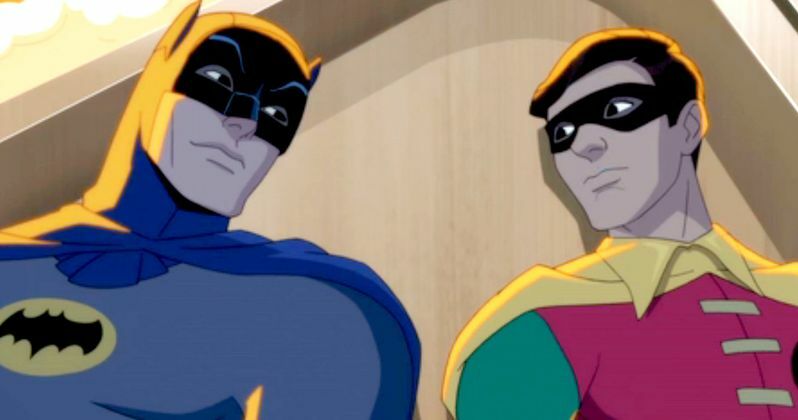 Back in March 2015, original Batman TV series stars Adam West and Burt Ward announced at the Mad Monster Party convention in Charlotte, North Carolina that they are both returning to voice Batman and Robin in a new animated movie. Although they didn't reveal the title or too many plot details at the convention, they did reveal that the movie would be released on Blu-ray and DVD at some point in 2016. Today we have our first look at this movie, entitled Batman: Return of the Caped Crusaders, which reveals that another Batman TV series star has come back, Julie Newmar as the Catwoman. Entertainment Weekly debuted this first trailer, which features both Batman and Robin getting out of a jam. The Caped Crusader and the Boy Wonder reveal they will square off against iconic villains such as the Joker, Riddler, Penguin and Catwoman, with their battles taking place both on Earth, and in space. Unfortunately, we don't have word on who's voicing Joker, Riddler and Penguin yet, but hopefully we'll have more details soon. Batman: Return of the Caped Crusaders will debut October 11 on Digital HD, with the Blu-ray and DVD release set for November 1. While we don't know for sure, it's possible that the world premiere of this movie could be held at New York Comic Con, which runs from October 6 through October 9 at the Javits Center in New York City. No details have been given as to who wrote or directed this animated superhero movie, but hopefully we'll learn more soon. During the convention last year, Adam West teased that this new movie would be 90 minutes long, and that it could spawn a new Batman animated franchise, since a second movie was already in the works. It seems likely that this movie will not be a part of the DC Universe Animated Original Movies franchise, which has an established continuity. Of course, a new Batman animated franchise will surely depend on how well this Batman: Return of the Caped Crusaders movie performs in the home video market. As of now, we don't have any details regarding pricing or bonus features, but hopefully we'll have an official announcement in the near future. Both Adam West and Burt Ward return to voice Batman and Robin in last year's hit video game Batman: Arkham Knight. Take a look at the first trailer for Batman: Return of the Caped Crusaders, and stay tuned for more details.